I have a hearty meatball recipe for you today. This one is made a bit healthier with the addition of farro. 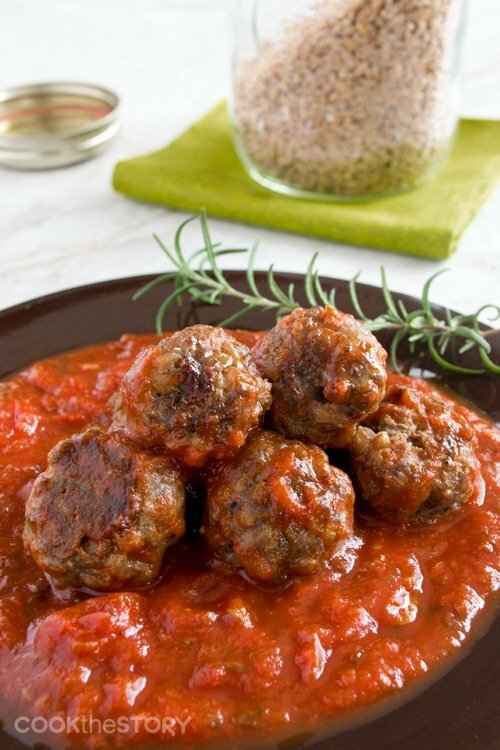 My kids love Italian food and meatballs, that Italian classic, are one of their favorites. They love them so much that I use them to help my kids get acquainted with new flavors and textures. 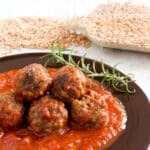 For this meatball recipe, I added some farro to the mix. Farro is an ancient grain that is high in fibre, low in gluten and has lots of protein. My 2 year-old daughter loves it, but my son, not so much. But he still loves this meatball recipe. And the thing is, the farro isn’t even hidden. You can see it right there inside the meatballs. He likes it anyways. Probably because these meatballs are just so good. For this farro meatball recipe the meatballs are baked in the oven rather than fried. I do this because it’s easier. The rolling of the meatballs can be time-consuming. After that, you definitely don’t want to stand over them at the stove, watching for browning and making sure to flip them in time. Instead, these go onto a pan in the oven for a little while. If you feel like it, you can roll them over halfway through for more even browning but it’s not necessary. Once they’re cooked, toss them into a pot with your favorite tomato sauce and let them simmer there for awhile before serving. Note that the recipe calls for cooked farro. Find out how to cook farro using three different methods (stove top, oven and slow cooker) over here. And I have another tasty recipe that uses farro as well. This one is for a farro side dish with cream cheese and spinach. A healthy vegetable, a good grain and some creamy tastiness to make everyone come back for more. 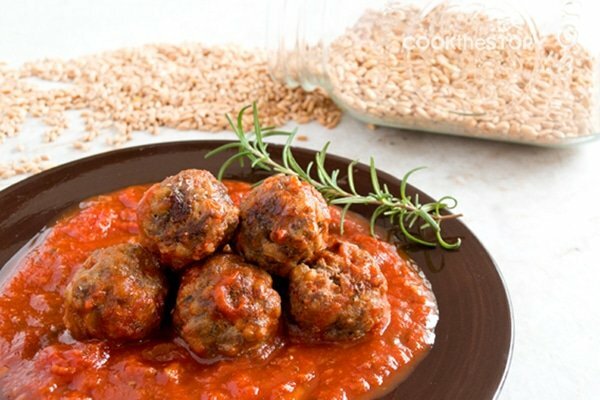 These tasty meatballs are made healthier with the addition of farro, a grain. Cook up 1 and 1/2 cups of farro (yielding 3 cups when cooked) the day before. Use half in as a side dish for that night and the other half in these meatballs. Find out how to cook farro on the stove top, in the oven and in the slowcooker here. 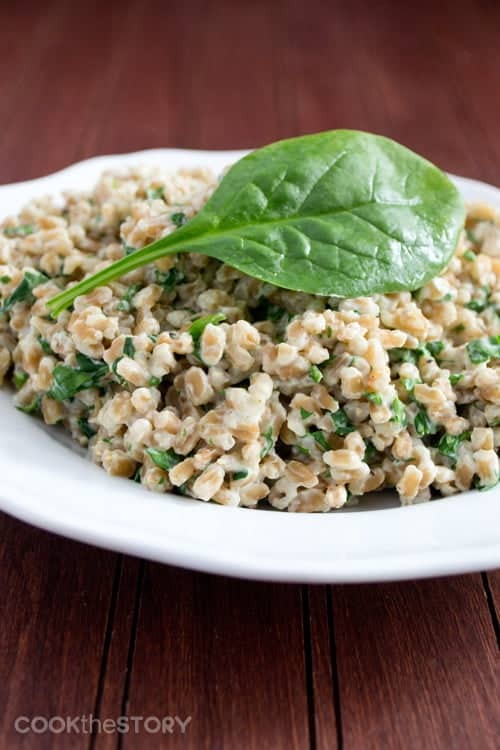 If you don't have farro, you can use cooked white or brown rice, barley or wheat berries instead. Once the meatballs are cooked, add them to your favorite warmed up tomato or BBQ sauce and let them simmer there for 10 minutes or so before serving. This recipe yields 30-35 one tablespoon-sized meatballs. Preheat oven to 450ºF. In a large bowl combine all ingredients. Gently form mixture into 1 tablespoon balls and place them on a large rimmed baking sheet. Bake until cooked through, 18-22 minutes, flipping each meatball over halfway through for more even browning.